Aegina is the prominent Greek island in the Saronic Gulf, 27 km (17 mi) from Athens. Traditionally, the island derives the name from Aegina who was the mother of the hero Aeacus and the island is named after her since this is where she gave birth to her son who became its king. Aegina was a major rival of Athens. 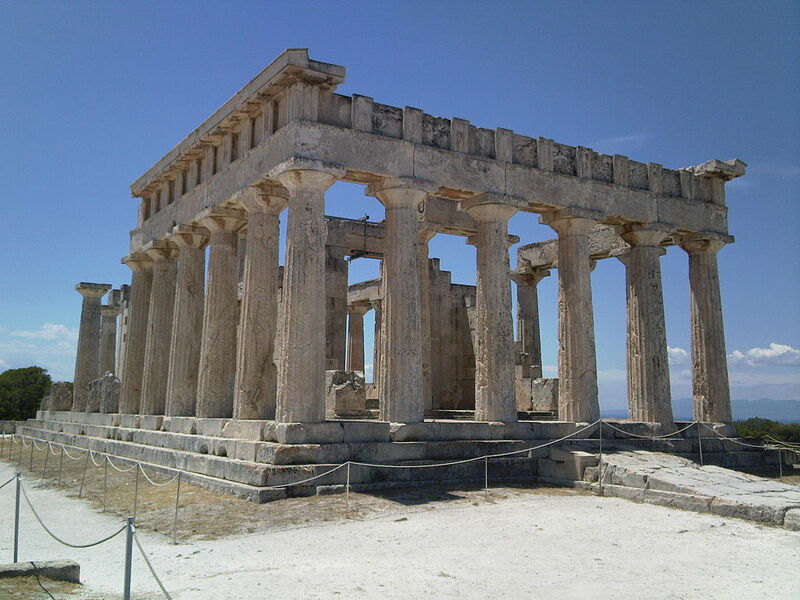 Originally, the temple on the island was known as the Temple of Jupiter Panhellenius Its structural archetecture is that of the great Doric style, but it became known as being dedicated to the mother-goddess Aphaia. Herodotus tells us that Aegina was a colony of Epidaurus, to which state it was originally subject. Minoan ceramics have been found in contexts of ca. 2000 BC and some have suggested that it was perhaps settled by the Minoans during their peak of expansion. The famous Aegina Treasure that is now in the British Museum dates to between 1700 and 1500 BC. and implies that during the Heroic period Mycenaean culture existed in Aegina for some generations after the Dorian conquest of Argos and Lacedaemon. Aegina was the the first Greek city-state to issue coins in Europe establishing the Aeginetic stater with a weight of about 12.5 grams.The design of the coinage is that of a turtle, which was an animal sacred to Aphrodite. The first coins were struck at Aegina that dates from 700 BC. Therefore, it is thought that the Aeginetans, within 30 or 40 years of the invention of coinage in Asia Minor by the Ionian Greeks in Lydia (c. 630 BC), may have been the ones to introduce coinage to the Western world. From the weights of some unusually heavy early specimens of Aegina staters coming in over 200 grains, it is possible that the Aeginetic stater may have originally weighed over 200 grains before it was revised. The Bibliotheque Nationale, in Paris, has a very unique electrum stater, obv. Turtle, rev. Inc. square divided into two parts, weighing 207 grains. Electrum is a natural alloy of silver and gold that emerged in Ionia. The date of this coin cannot be much later than about 700 BC. It clearly is attributed to the class of early electrum money struck on the Phoenician standard. The design type implies it is connected with Aegina. However, the form of the incuse on the reverse points to an Asiatic origin. Since electrum was not native to Aegina, if this early specimen is indeed from there, it implies that the metal came in trade and the coin was struck giving rise to the invention of coins in Ionia. The fact that the Aeginetic standard of weights and measures (developed during the mid-7th century) was one of the two standards in general use in the Greek world (the other being the Euboic-Attic) is sufficient evidence of the early commercial importance of the island. The Aeginetic weight standard of about 12.5 grams was widely adopted in the Greek world during the 7th century BC. 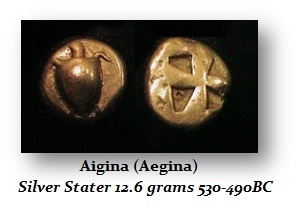 The Aeginetic stater was divided into three drachmae of 4.1 grams of silver. 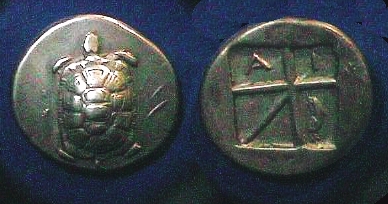 Staters depicting a sea-turtle were struck up to the end of the 4th-century BC. Following the end of the Peloponnesian War, 404 BC, it was replaced by the land tortoise.